It is becoming every parent’s nightmare to let their children play with a family dog due to the media reporting a dog attack almost every month. Some parents even to the extend of getting rid of their canine family upon the arrival of a new baby. As a parent and a dog owner myself, I understand your concern for the safety of your children. I know it is a heart breaking situation, especially if your dog has become a part of your family. However, there is good news and you don’t have to get rid of your canine family by following the tips provided in this article. Dog attacks on kids can be prevented if we adults take the time to learn what causes these incidents in the first place. The lack of such education is causing all the distress in our world between us and our canine family. Respecting a dog and their space is key to avoiding dog aggression. As dog owners,we must understand that our canine family thinks different from us humans. Dogs and humans perceive affection differently. Hugging for example, makes us humans happy and is a comforting act but to a dog it is showing dominance over them. Family dogs will tolerate this act of human affection, even though they don’t enjoy it, as long as they see you as their leader. 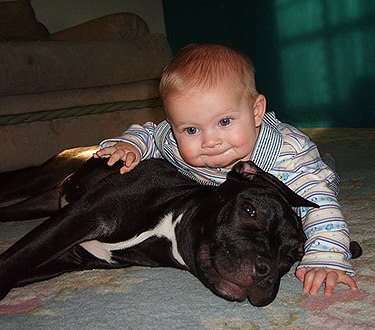 The same act done to a dog by a toddler may not result in a positive outcome. 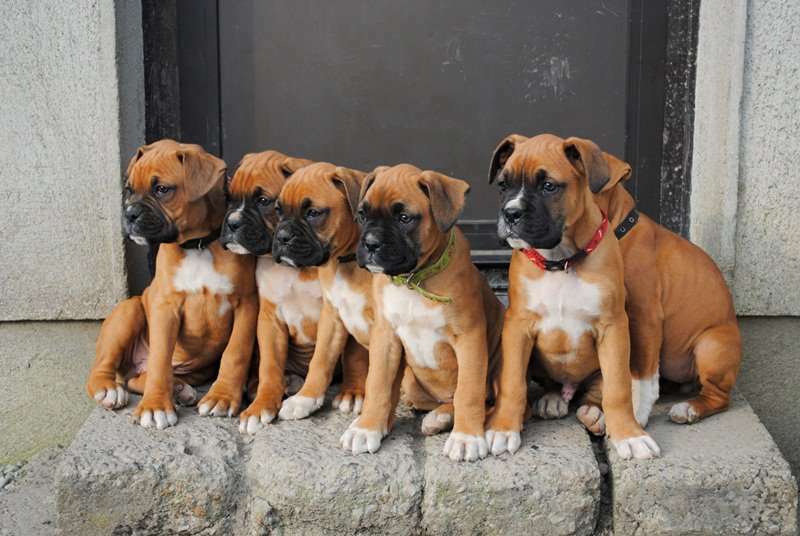 Most family dogs quickly learn that they can overpower baby’s and toddlers and they automatically place themselves one step above the child in the pack. Did you know? Center of Disease Control & Prevention reports, of all the dog bites reported in the United States, sixty percent of them are children? Parents should keep this in mind and educate their children that extreme touching and hugging causes stress for the dog. We should teach them to respect the dog and enjoy them from a distance & if they were to get any closer to pet them an adult should supervise them at all times. A good time to let your children pet your dog is when he or she has a wagging tail which shows they are in a good mood. A dog will show many signs of stress before it resorts to biting. These signs are transparent and they are often difficult to pick up especially if you don’t know what you are looking for. Picking up on these signs early on can indeed prevent dog attacks on kids. Some of these stress signs include but are not limited to. If you see any of these signs, please do not ignore it because your dog becomes a ticking time bomb around your kids. If you think nothing of it now, not only the dog’s stress increases overtime but you can put your children in grave danger. Remember that most of these dog attacks on kids are by well cared for family dogs which is why it is important to monitor your child’s interaction with dogs. I want to bring to your attention another reason why a family dog may bite, no one talks about this but if your dog gets a new toy, they can become extremely possessive of it in the beginning. This is especially true with bones, they can bite your kid if he tries to take it from the dog. Our adorable little baby Sid is 9 months old now and he is constantly crawling after the dog. It seems like the more we divert him the more he wants to go after the dog. We have to watch him like a hawk and some how he still manages to get a hold of the dog’s toy. A friend of ours gifted us a play pen for Sid but we ended up securing our dog in there instead. This seem to work very well for us, we have an open living space and the baby gets to roam around everywhere and we can still keep and eye on him. 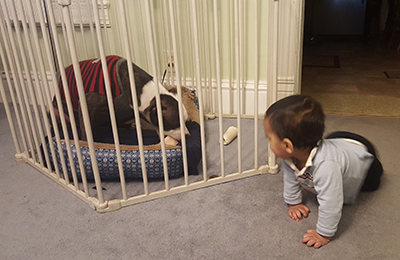 Our Pit Bull Phoenix gets to stay in the play pen with her toys and we don’t have to worry about little Sid bothering Phoenix. If you are a new parent and have a family dog, I highly suggest that you get one of these also, if you don’t use it for your baby you can always use it to secure the dog. We also use baby gates in our household to separate the dog and the baby at all times we are not right in front of them. What is great about the summer infant secure panel is that, you can separate the baby and the dog even if you don’t have an area where you can attach baby gates to. We use them in combination for the best results, we block all our stair entrances using the baby gates and in the main living areas we use the secure panel. 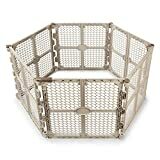 Here is a baby gate that we recommend, these don’t require drilling holes in the walls etc. they are an easy install for anyone using the pressure mounting system. We hope this article was informative in securing your children and pets. Be sure to subscribe to us and get more interesting reads like this one. Thanks for this article! We don’t have children yet, and we love our Amstaff to death. I’m glad the approach you’ve described here has worked well for you. This is what I plan on doing and really happy to hear your story!